The Insignia Series is a combination of Five Pawns' most popular flavors. The Insignia Series is a combination of Five Pawns’ most popular flavors. Sometimes it can be hard to decide which e-juice brands are worth the money. Every company bills itself as producing “premium” e-liquid and, honestly, a lot of them don’t deserve that label. If you don’t want to take any chances and want to vape something that you know will be amazing, it’s always a good idea to go with one of the more established brands. 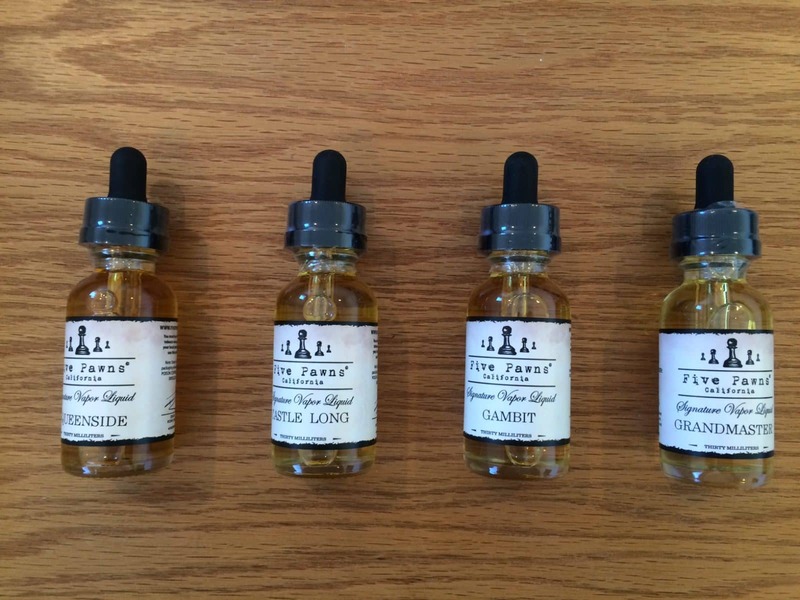 Five Pawns has been around for a while and they have a great reputation in the vaping community for creating great high quality liquids. In this review I’ll be checking out four different flavors from their “Insignia Series”, a collection that encompasses the five flavors that Five Pawns is most famous for. So the first thing I do whenever I order a pack of different e-juice flavors is open the packaging and smell each one to decide which to try first. The sweet, creamy scent of Queenside definitely caught my attention first, so I’ll start there. Queenside starts with a really powerful citrus orange base combined with a rich, creamy French vanilla flavoring to really mellow things out a bit. The first thing that popped in to mind when looking for a comparison would be those Creamsicle pops that I always liked as a kid, but that’s not exactly an accurate comparison. This doesn’t feel like a dessert flavor. Rather it tastes more refined and grownup somehow. Like I’m eating the actual fruit and a high-quality French vanilla ice cream on the side. I’m definitely a fan of this one. The main note of this flavor is a dark, smooth Kentucky Bourbon flavoring. Revolving around the main Bourbon flavoring is a cluster of more subtle notes. You get a bit of roasted almond, toasted coconut, vanilla bean, and a slight hint of brown sugar. These subtle flavors serve to effectively mellow out the powerful Bourbon flavor, making this one of the smoothest whiskey e-juices I’ve ever tried. Grandmaster is more a savory type of flavor. The most prominent note on this one is the banana cream, which is complemented by an almost equal amount of creamy peanut butter flavor. You also get a bit of caramel flavoring, which I mostly noticed on the exhale. If you like banana flavored juices but are getting sick and tired of brands that make you feel like you’re getting punched in the face with a candyish “banana flavoring”, this is the one to go with. It’s a much more subtle and nuanced take on banana e-liquids that manages to give you just enough flavor without being overpowering. This one is your classic homemade apple pie flavor. I was a bit skeptical before trying it, but it actually manages to replicate the complexity and subtle flavoring of real apple pie almost flawlessly. Not only do you get the sweet apple pie filling flavor, but they also included a decent amount of vanilla and whipped cream flavoring to accurately recreate the toppings. Amazingly, I felt like I could also taste the soft, flaky crust as well. I’m not sure what type of flavor they used to replicate the crust, but it was incredible. You can buy the Insignia Series at FivePawns.com. All flavors were sampled using either a Wulf Mods Lone Wulf mech mod and RDA or an iJoy Maxo Quad 18650 box mod with an OBS Engine tank.